Are you looking for the best adaptogen supplements for stress? Adaptogenic herbs can help the body control stress hormones. Let’s compare these remedies. There’s no way around it …. You’re going to have stress in your life. To stay healthy, you need to learn how to manage stress. One of the best supplements to take for stress management are so-called ‘adaptogenic herbs.’ Also known as adaptogens, these special botanicals help control the amount of stress hormones circulating through the body. Let’s take a look at some of the best adaptogen supplements for stress…. Meditation, Tai Chi, Qigong and yoga are excellent stress-reduction techniques. These ancient healing practices are scientifically proven to lower blood pressure and stress. Another ancient healing technique that also has been recently verified by clinical trials to have amazing stress-lowering properties are adaptogenic herbs. They are nontoxic. Unlike some pharmaceutical drugs as well as other non-adaptogenic herbs, adaptogens can be taken for an extended period of time. They help the body resist stress of all kinds. Adaptogens regulate how much stress hormones (cortisol, for example) is released from the adrenal glands. Because of this action, adaptogens help bring the body back to balance. Adaptogens produce a nonspecific physiological response. This means that unlike, say, a drug that has one purpose of lowering blood pressure, adaptogens carry out multiple processes. Adaptogens can stimulate under-functioning organs and help calm hyper-functioning ones. Although the exact number of adaptogens on the planet isn’t determined, the amount of them compared to the overall amount of medicinal plants is relatively small. For every few thousand medicinal plants, perhaps only a few would meet the definition of being adaptogenic. All adaptogens possess the three characteristics above. But each adaptogen has its own unique set of properties. How long have adaptogens been studied? Although adaptogens have been used for countless generations by virtually every traditional society, they have only been studied since the mid-20th century. Soviet researchers were the first to study their properties. The government of the U.S.S.R. funded much of the research on adaptogens. The Soviets were looking for an inexpensive competitive edge for soldiers and pilots, athletes and workers. The stress-controlling properties of adaptogens were clinically proven to enhance strength, concentration and stamina/endurance. These benefits are the result of the body having more energy as the result of being less stressed-out. What are the best adaptogen supplements for stress? Ginseng supplements have been extremely popular for at least a few decades. But many supplements that claim to be ginseng are not true ginseng. Only the Panax species of ginseng is considered true ginseng. American ginseng (Panax quinquefolius) can help control stress as it has more of a calming nature on the nervous system. Therefore, it’s one of the best adaptogen supplements to take for stress. The Soviets focused much of their research on Siberian ginseng, which is not truly ginseng. It’s more like a botanical cousin once-removed from panax species. Also called eleuthero, Siberian ginseng was the first herb identified as an adaptogen. Thousands of studies involving Soviet subjects—pilots, long-haul truck drivers, infantrymen, athletes, prisoners—were performed to assess eleuthero’s adaptogenic effects. The clinical trials were often performed in situations of extreme stress. Siberian ginseng was proven to increase oxygen in athletes and help them recover faster. Laborers improved their immunity and were able to produce more work, often with less sleep, albeit a more restful sleep. Rhodiola is another adaptogen that has amazing stress-lowering benefits. It can help clear mental fogginess and improve memory. It can also increase cellular energy production. Some other benefits of rhodiola include: adrenal function improvement; nervous system calming; cardiovascular protection; libido boosting; normalize cholesterol levels, and more…. Used in India for at least 3,000 years, ashwagandha is one of the most popular herbs in Ayurvedic medicine (the traditional healing philosophy of ancient India). Ashwagandha energizes the cells; improves reproductive health, normalizes adrenal gland function, regulates the endocrine system, reduces anxiety, helps build muscle mass, prevent tumors, and contains anti-inflammatory properties. Unlike culinary mushrooms like shiitake, reishi is primarily a medicinal mushroom. It’s been clinically-proven to boost immunity. Reishi also can help relax muscles, improve sleep quality, manage pain, normalize cholesterol, and has demonstrated free-radical scavenging qualities in clinical trials. Schisandra, along with rhodiola and eleuthero, were shown in one study to “induce a state of nonspecific resistance to highly toxic chemicals such as chlorophos, phosphorus, cyclophosphane, strychnine, aniline, and sodium nitrite. These adaptogens also demonstrated the ability to protect against microbes. In addition to ginseng, there are probably other adaptogenic herbs you’ve heard of. You may have not known that they meet the definition of adaptogens, but they most certainly do. These include maca (aka ‘Peruvian ginseng’), goji berry, guarana (an ingredient added to many energy drinks), and acai. All these adaptogens, as well as astragalus, Asian licorice root, catuaba, horny goad weed, and dozens of others all help regulate our stress response. Adaptogens can benefit everybody, especially those who have chronic stress. But instead of taking a single adaptogenic herb, it’s better to take a formula. So, the best adaptogen supplement isn’t a single herb, it’s a combination of herbs. Adaptogenic herbs work synergistically. That means adaptogens, when included in a formula, work together as a team; they enhance each therapeutic compound in every adaptogen. Exactly how do adaptogens work? Here’s why adaptogens are great for people who are chronically stressed…. Your hypothalamus gland releases CRH (corticotropin-releasing hormone). This is the emergency alarm that goes off when a stressor is perceived. Chronic release of CRH triggers anxiety. CRH then goes to the pituitary gland. The pituitary releases ACTH (adrenocorticotropic hormone). ACTH triggers the release of cortisol from the adrenal gland cortex. With prolonged stress, your body exhausts itself from constantly releasing CRH and ACTH. This is where the magic of adaptogens happen. Adaptogens control the release of CRH and ACTH. Taking adaptogens over time can help get your body and mind back to feeling normal. You may no longer feel “burnt out” from all the stress hormones flooding your bloodstream. 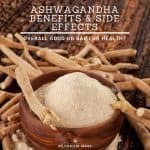 Ashwagandha Benefits and Side Effects: Good for health?